Verywestham: HOLD ON! Take a closer look at the neck of the new strip??? HOLD ON! Take a closer look at the neck of the new strip??? The new kit was unveiled this morning to much praise from fans. 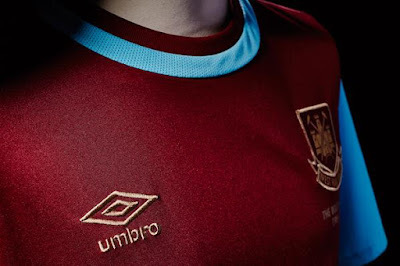 The pics look great and the added design about the Boleyn should make it an eternal classic. However, all we have seen are pics - take a closer look at the neck....the blue is sewn ON TOP OF the collar....YEUCHHH!!! What do you think? 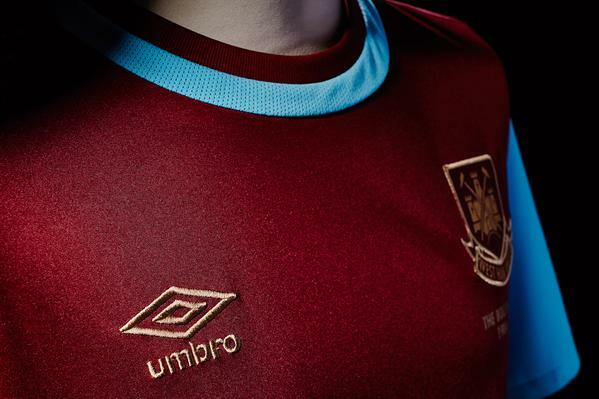 Have Umbro come close but ultimately messed up? Oh no for sure they look like bobbles in the material at the neck that could grow into saggy bits over time with repeated washing. This is a potential disaster and the club should pull the shirt before its too late. Thats harsh. It looks neat and the balance of claret n blue is spot on. The extra Boleyn badge is tasty. Here we go the trolls tossers had raise their heads above the parapet at some stage i guess. It's a football shirt made of a man-made fabric, probably with a nauseous artificially technical name to justify the price tag. The design makes a notional nod to some heritage, but it's probably made by under-age kids paid $1 a day in some far-flung sweatshop. That will be the true historical link - that the people making it are paid the same as in 1904. It will be priced at ten times what's really worth and it will sell by the thousand. That's the reality. And what's the betting that XL will be the most popular size as we're football fans and really couldn't care less so long as we can wear the latest club offering.